This column was originally posted in The Inkwell and on its website. Ok, so who went on this crazy rant? A.) Seattle Seahawks’s star cornerback Richard Sherman; B.) Kanye West playing Madden; C.) Predator; D.) All of the above. DING! DING! You guessed right ladies and gentlemen. It was D, all of the above. The rant happened right after he made the biggest play of his life by tipping Colin Kaepernick’s touchdown pass attempt to Michael Crabtree in the closing seconds of the NFC Championship game. Sherman’s tip of the ball landed in linebacker Malcolm Smith’s hands to seal the game — a 23-17 victory over the San Francisco 49ers to send the Seahawks to the Super Bowl. What followed was Twitter-erupting, convulsing, and going into panic mode. My immediate tweet was: “Sherman might be the most embarrassing, great player in the league.” I agree and disagree with my tweet. Sherman’s rant was embarrassing, he is one of the great players in the league, but he’s much, much more than someone who had an embarrassing rant or what many people called him on Twitter. Sherman grew up in Compton, Calif., attended Compton Dominguez High School where he had a 4.1 GPA, and became the first student from his high school in 20 years to be accepted into Stanford University. On the gridiron, Sherman was listed at 6’3” and just 167 pounds. He was a three-way star at corner, receiver and returner, as well as track in the offseason, though Rivals.com only rated him as a three-star recruit. At Stanford, Sherman was the team’s leading receiver as a freshman and sophomore, but suffered a season-ending injury as a junior. He received a medical redshirt, and surprisingly asked head coach Jim Harbaugh — now head coach of the 49ers — if he could switch to cornerback. Sherman played solid at his position for two seasons, but wasn’t drafted until the fifth round of the NFL draft, which just fueled his fire. Since coming to the league, Sherman has been named a first-team All-Pro twice in his first three seasons, becoming one of the best, if not the best, cornerback in all of football. The NFC Championship game and Sherman stole the show on the best Sunday of NFL football of the year. Before the Seahawks wrote their ticket to the Super Bowl, Peyton Manning and the Denver Broncos defeated Tom Brady and the New England Patriots, 26-16, in the AFC Championship game. Manning was nearly flawless, going 32-of-43 for 400 yards and two touchdowns. After the game Manning spoke highly of his center Manny Ramirez, his receivers, and the exciting feeling of reaching his third Super Bowl. “Well, it’s an exciting feeling,” Manning said after the game. “You do take a moment to realize that we’ve done something special here and you certainly want to win one more.” Not the word I or me once. As the confetti came pouring down, Manning gave a classic emotionless stare into the abyss. This season, Manning broke multiple NFL records in perhaps the greatest regular season by a quarterback ever. He threw for 5,477 yards and 55 touchdowns, both NFL records, while only throwing 10 interceptions. Manning was the No. 1 overall pick in the 1998 NFL draft, his father Archie was an NFL quarterback, and younger brother Eli has won two Super Bowls with the New York Giants. So, essentially the matchup of Sherman and Manning seems like two complete opposites, right? Not exactly. Manning too broke Twitter in the last few days, except in a much different way. His constant audible call of “Omaha” had fans and the media going crazy. #Omaha was trending everywhere and the audible turned into a good cause for more than just another Broncos touchdown. “Omaha” raised $24,800 for Manning’s charity during the AFC Championship game, thanks to being called 31 times. Eight businesses committed to donate $800 to Manning’s Peyback Foundation every time he called the audible. Though Manning was basically born to play quarterback and is considered one of the greatest to ever play the game, he too plays with a chip on his shoulder like Sherman. He beat Tom Brady and the Patriots, but is constantly compared to the rival quarterback for his playoff record, Super Bowl rings and head-to-head battle. Even with the win, Brady is 10-5 against Manning. Manning is currently 11-11 in the playoffs, and 1-1 in Super Bowls. This is his first Super Bowl with the Denver Broncos, and at age 37 with a bad neck, this could be his last. Manning won’t say it, but a win in this Super Bowl could ultimately define his legacy. Late Sunday night, Manning was probably enjoying a Papa John’s pizza in one of his Buick Veranos, while Sherman was tweeting, “A lion doesn’t concern himself with the opinions of sheep.” Feb. 2, please get here sooner. In two weeks we will finally see the NFL’s best defense of Sherman and the Seahawks go up against the best offense of Manning and the Broncos. The matchup of Manning and his fivehead against the Shermanator is what we have all been waiting for. Great words on a truly up scaled debacle! Loved the piece! 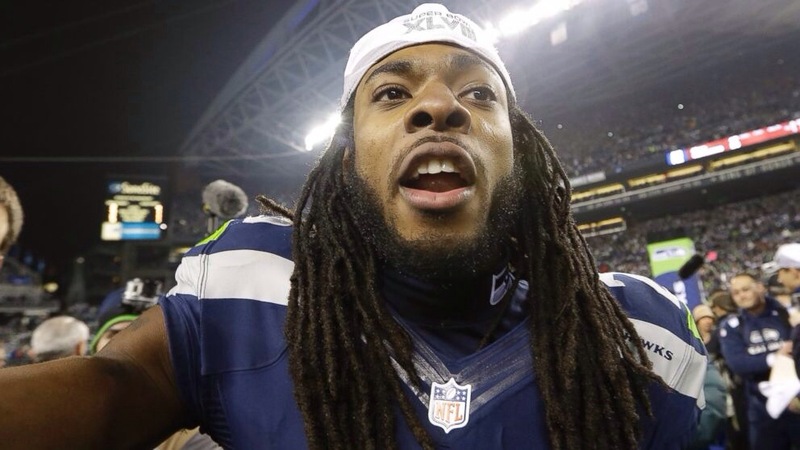 I had some words to say about it in my most recent post Taming a Tiger known as Richard Sherman. I would love to hear what you think!